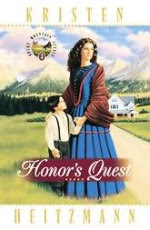 I am continuing on my reading in to the Rocky Mountain Legacy with book #3, Honor's Quest. This is the book that solidified my liking of Kristen Heitzmann's writing style. Her first two books in the series were really good and I enjoyed them. Honor's Quest is enjoyable, but it isn't as light as the first two books. Honor's Quest starts off with Monte and Abbie called off to Charleston. Monte's sister France has died and she wanted Monte and Abbie to take care of her daughter Jenny, since her husband Kendell died in Honor's Price. A lot hard times are in store for Abbie and her family. When Monte and Abbie return from Charleston, Monte is faced with a finical crises, when during a harsh blizzard, a lot of his stock his killed, stock he was needing to get him and his family and the ranch stable. Plus, having lost a valuable piece of stock to Kendell in a sour deal in Honor's Price didn't help. Thankfully, not everything in the book is as dour as it appears, Abbie is pregnant and looking forward to her future with her growing family. Happiness is shattered though when another tragedy strikes, the hardest blow that Abbie will ever have to face. Heartbreak and bitterness will become her only friends. All of the original characters are back and we are introduced to a new group of friends as well. I love the depth that these characters have in this story. It flows and keeps you picking the book back up to see what else is going to happen. It's too read!